Properly performed FUE gives the appearance of a scarless hair transplant but it isn't truly scarless. 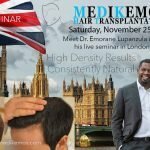 I wish to address the state of FUE ( follicular unit extraction) scarring as it stands in 2017 and the myth of the scarless hair transplant surgery, as this myth apparently still exists and is, in fact, being perpetuated by both FUE only clinics and former strip only clinics that used to claim themselves that FUE is not a scarless procedure. FUE scars are real, and the fact that skin that is cut will scar is as true today as it was fifteen years ago when FUE first made it's entry into North America. Why? Because the human body has not evolved to the point where it will regenerate skin on demand when necessary. We are not salamanders! It is a simple biological fact that the skin will scar when cut and the degree to which skin will scar after it is cut, be it from an FUE surgery or a strip surgery, is unknown to anyone. The ONLY thing that any clinic can rely on to gauge the future probability of scarring is their own skill and how it relates to the history of their results in their own clinic, and this is going to be a mixed bag regardless of what they may tell you. Why? Because the one variable they cannot control is you, and the way that YOU heal. If you are considering hair restoration surgery and you have chosen FUE as the procedure for you then you have to understand that you will have restrictions with your hair styles just as you do if you choose to have a strip surgery, albeit these restrictions are fewer overall (more on that later). Remember, the only reason that FUE was even conceived was because of bad strip surgery (and plug surgery) and the evolution of male hairstyles to include shorter and shorter lengths that will expose, in some cases, even the best strip scar. That's it, there is no other reason. 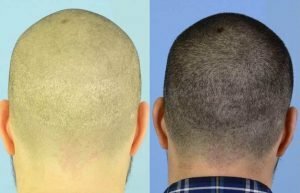 FUE was not invented because it offers better growth nor was it invented because the grafts obtained via the FUE technique are better than strip grafts in any way. In fact, it has taken FUE at least a decade to be on par with the quality of strip grafts from the better clinics and in many cases the grafts still are not quite as good. My position on the matter is that FUE grafts from top clinics are close enough to strip grafts in quality that the disparity does not make for a cosmetic difference but technically speaking, on average, I believe FUE grafts will have a slightly lower survival rate, graft for graft, when compared to an equal sized procedure performed with strip. The concept of follicular unit extraction, or "FUE", started to gain traction in 2002 when patients and FUE advocates in general tried to paint a rosy picture of FUE being a scarless hair transplant surgery. During these early years strip surgery advocates (including myself) would state that when the skin is cut, a scar forms, and many FUE advocates would argue that the punches used for FUE were so small that the scar formation would be "extremely" difficult to see and "virtually invisible". This was back when the average sized punches were .9mm at the smallest and as large as 1.35mm. Some FUE advocates and doctors would even replace the word "scar" with the word "hypopigmentation" and explain that the scar tissue visible is not actually scar tissue at all but is in reality nothing more than a lack of pigment. This use of the word "hypo pigmentation" is complete nonsense and it is only in use because the word "scar" is a four letter word, both literally and figuratively, in the hair restoration industry. If you use the word "scar" it will leave a negative impression in the mind of the patient. That, my friends, is marketing. Even good FUE scarring shows that FUE is not a scarless hair transplant procedure when shaved. If you were told by any doctor or anyone in their organization that you will have a scarless hair transplant surgery with FUE then you were lied to. 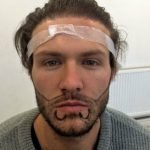 This is why anyone that expects their FUE hair transplant to be scarless should stop and reconsider their priorities for having a hair transplant to begin with. What is your goal for having a hair transplant? Are you expecting to have more hair so you can shave your head and sport the "shaved look" but with a full looking head of hair? I'm here to tell you, that won't happen. The entire idea that you can have a scarless hair transplant and you can shave down close to the skin like seen on a military style "high and tight" haircut, and you will have no visible evidence of having had surgery is a flat out lie. Can you have a short haircut? Of course you can, potentially, and if the placement of the grafts matches that of your native hair with regards to the angle and direction, then you can have a really nice looking result but you will NOT be able to fool anyone into thinking you have a full head of hair that has been shaved. 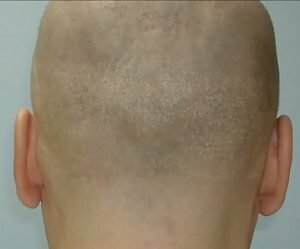 The best you can expect is that you'll look less bald but if you hope to do this and shave your donor zone then you will be disappointed with the end result as you will have either visible dot scars or visible gaps where a follicle once existed before it was extracted. This patient had too many grafts taken from too small of an area. You can literally see the square box where grafts were extracted from. If you want to have a really short haircut after an FUE procedure there are a few things to remember. You have to keep in mind that the reason why strip scars are so visible is because the pattern of a linear scar, the line, draws the eye and is visible against the background of hair follicles that they reside within. FUE scars don't have this problem because they're simply a dot and while shaven they can be seen but with any length of hair growth (buzz cut) they will look like a gap where hair once grew but no longer exists. This actually occurs naturally and one or two, or even a dozen of these gaps doesn't look unnatural as they're seen throughout the scalp. 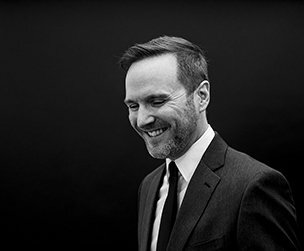 The problem develops when the extractions are performed in too small of an area and these gaps lead to a patch of hair that is less dense than the surrounding hair, thus your doctor (or the technician) has just created a new pattern for those around you to see which in turn completely negates the reasoning for having FUE to begin with. So, you have to find a clinic that does not take your grafts from too small of an area in your donor zone. 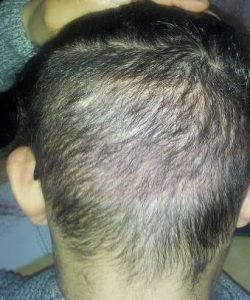 The "traditional donor zone" for surgical hair restoration is currently still looked at from the strip surgery point of view by most clinics, especially former or still practicing strip clinics, in that you have a narrow band of hair in the back of your scalp and on the sides of your scalp, above your ears, that is expected to be resistant to the effects of DHT. This is largely still an appropriate view to have but the FUE donor zone overall, because it is not limited to the "sweet spot" in the middle like strip, enjoys the benefit of being able to have hair taken from all areas of the traditional donor zone, along the fringes of the top and bottom as well as the ends on either side. Strip surgery is limited to narrow areas of the traditional donor zone by the very mechanics that make strip surgery what it is. When the clinic you choose takes your hair from all corners of your donor zone the visual impact created is much less likely to draw attention. In addition, you will not feel such a dramatic density reduction which makes your hair feel less full and voluminous. If you are one of those people that wants scarless hair transplant surgery because you literally want to shave your head after you have an FUE hair transplant surgery then you should reconsider having a hair transplant at all. You have to have the perfect combination of characteristics, find the right doctor, and have a perfect extraction pattern of your grafts to achieve your goal. Odds are that this will not happen. 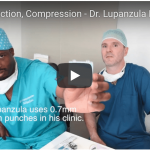 Besides finding the right doctor, that uses the right sized punch, and understands the right extraction pattern, or lack of a pattern, for your case you have to have the right physical characteristics as well. Fair skinned patients stand the best chance of having barely visible scarring when shaved to the skin because of the lack of color contrast between very white skin and white scar tissue but even then they have to avoid as much sun exposure as possible to prevent pigment formation in their donor zone. This will allow the FUE scars to stand out as the surrounding scalp gets more sun exposure. Remember, scar tissue does not tan! If you have any color to your skin then you stand a much higher probability of your FUE donor scars looking like white dots against your skin tone and this is what you want to avoid. FUE is a fantastic procedure and it can and does allow for shorter hairstyles when compared to strip hair transplant surgery but it is not a perfect solution so before you jump into FUE hair transplant surgery, or any hair transplant surgery for that matter, do yourself a favor and remember that with surgical hair restoration you are potentially creating a new problem when treating and existing problem. Do NOT Have Hair Transplant Surgery!!! Natural Hairline. What Does This Mean?